Camp Pennsylvania: I’m talking with Warren today. He’s the Parks Operations Manager at Codorus State Park in Pennsylvania. Warren, why don’t you get us started with telling us about a little history of Cororus State Park? Warren: Okay. Codorus State Park is 3500 acres. And of the 3500 acres, about 1275 acres is called Lake Marburg. What happened in 1960s, Glatfelter Paper Company wanted to build a paper mill and paper mills needs lots of water to be able to make paper. So, what they did was they came in and they built the Park, and that’s what the water is used for. They take out about nine million gallons a day to run the paper mill and we use it as recreational on the other end. This was back in the 1960s. The hardest part was filling the lake up, but we had a small hurricane in those early years, 1967, and the lake was filled up by that. We have four tributary streams that feed the lake and that creates the area to be able to keep it all beautiful and water resourced for our people. We allow 20 horsepower on our lake and we have 480 marina slips that we use for kayaking, pontoon, sailboats, and that. So, it’s a huge recreation for water resource. CP: So, you said the four tributaries. So, those apparently supply enough water to meet the demand of the paper mill. CP: Oh, okay, interesting how that all works out. That’s pretty cool. What types of camping do you guys offer there? Warren: We have 198 campsites, and we have a variety of things. We’ve got our major electrical hook-up, which is 50amp. We don’t have water and sewage in this Park, but we have full washhouses that are in between all the sites. We have camping cottages and we also have what’s called a yurt. A yurt is a Mongolian-style tent that has a refrigerator and stove inside. You arrive and you already have your tent setup. Each site has a picnic table and a fire ring, and then we also have a primitive area, which is down along the lake. It just has a picnic table and a fire ring. It does not have electricity. CP: Okay. Do the yurts have any sleeping accommodations inside them? Warren: Yes, our cottages and our yurts in Pennsylvania State Parks always sleep five. CP: Okay, and are those are beds with mattresses? Warren: Correct, yes. The difference between the cottages and the yurts: the cottages have just a bed and table, where the yurts have refrigerator and stove. A little more upgrade. We don’t have showers. You have to walk to the shower house, which is about 25 to 30 yards away. CP: Okay. What would you say the most popular activity is for guests at Codorus State Park? Warren: Our biggest thing is our water recreation. Very, very popular. People come here and go. We have a swimming pool here also, which has just been upgraded. It’s about three years old now. It has a water park, water slides, and the big draw to the Park is recreation as a water-form. Kayaking has exploded in Pennsylvania. People just love getting out and seeing the wildlife. And also, we’re a large pontoon lake. People like to go out and go fishing, and explore the lake that way. CP: Can you swim in the lake? Warren: We do not allow swimming in the lake, and the reason for that is because of the drawdown each day. Glatfelter Paper Company. Our shoreline changes all the time. If we don’t get rain, you can really see the water starting to get down. By the end of the summer, we’re down about ten to 15 feet, but our swimming is allowed only in our swimming pool. But we do allow a thing called bobbing. And if you own your own boat or kayak and you go out on our lake, you’re able to jump off with a lifejacket and bob in the lake. CP: Oh, fun, okay. And what are some the favorite attractions in that area if I wanted to venture outside of the Park? Warren: We’re a huge, big area here. York, Pennsylvania is a lot in history. We’ve got other State Parks around, but we’re only 16 miles from Gettysburg. Warren: So a lot of people come to visit that and a lot of other things here as far as (Unclear 4:13.2) and we have Snyder potato chips and have tours here of their plants. One makes pretzels and the other makes potato chips. Warren: If you’re down in the town of York, the Revolutionary War was here, so there are some items people like to come and visit. And we’re not very far from Lancaster, which is the Amish area where people come to visit also. CP: Does it smell like French fries around the potato chip plant all the time? Warren: Yes, yes it does. That’s a very nice tour. They give you a bag of potato chips and you get to see when the potato comes in on a truck all the way out to become a chip. CP: Cool, two more questions for you, Warren. If you were going to spend just one hour at Codorus State Park in Pennsylvania, how would you spend your time there? Warren: If I came here, the biggest thing is to come to our overlooks. We’ve got a couple scenic overlooks that overlook the lake. We have a lot of wildlife here. We have nesting eagles. We have nesting osprey. Very good place for water (Unclear 5:08.2). I would do that. And also then I would go on our hiking trails. There’s not a lot of hiking, but equestrian. We have some of the best hiking trails and we have 18 miles of equestrian horse trails for some of the most beautiful interstate. CP: Okay, and last question. 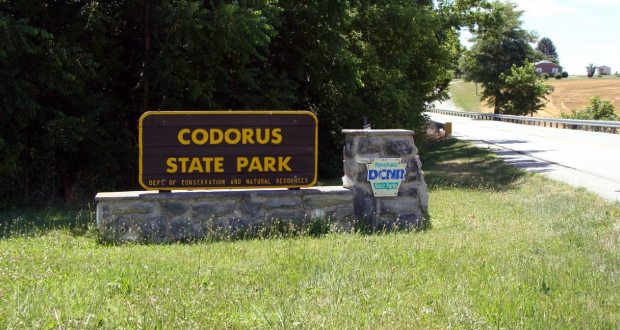 If you were going to spend just one night at Codorus State Park, which specific site would you stay at and why? Warren: I would stay down by the lake, which is our primitive area, because that, to me, as you get there and you put your tent up, you’re right by the water. You’re able to walk up to the shower house if you have to, but you get to enjoy more of an open space and be able to be down by the water. CP: All right, sounds good. Well, thank you for that tip, Warren, and thank you for taking some time out of your day to chat with us about Codorus State Park in Pennsylvania. Warren: You’re welcome. Hope you can come visit our beautiful Park.